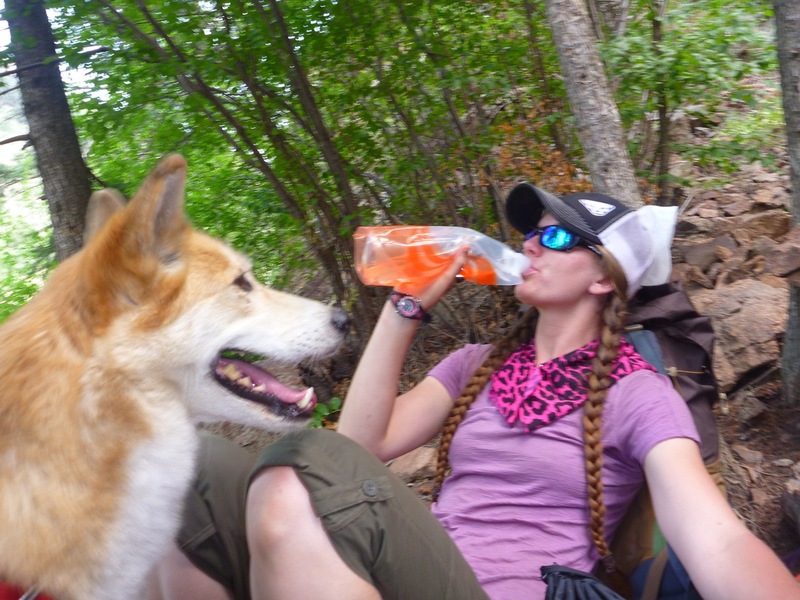 The following entries are a compilation of journal notes I took during our Colorado Trail thru-hike in July 2012. They are relatively unedited and un-editorialized, sort of like an unabriged Lewis and Clark journal versus an editorialized book (Unlike L&C, I'll fix most spelling though!). The plan is to put something much more digestible later, so this exercise is as much for me getting the information down as for the readers. The adventure begins. 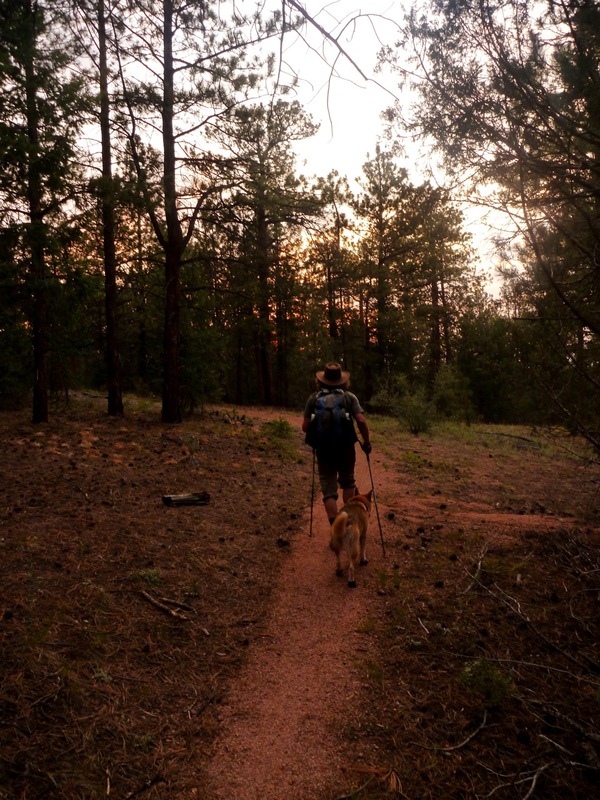 Jean from Eldora picked us up at 6:30 am for a ride to our new home for the next 25 days or so – the Colorado Trail. A longish ride around the suburbs of Denver to the Indian Creek, where we were forced to start from as a result of bringing along our dog Stella. Oh well – Waterton Canyon is just a dirt road anyhow. A big concern for this trip is water, as Colorado is in a big time drought following a dry winter and super hot summer. Fire in the Flatirons right before we left. After a couple hours we arrived at the trailhead. Jean bade us a hasty goodbye and was off – just the three of us, to live and travel and survive in the Wilderness for the next month. Headed out into a nice cool, shaded gully – gurgling creek nearby and a few very friendly mountain bikers bade us on our journey. The trail began to climb a long, dry ridge that was our first pre-cursor to how hot this day would be. Our packs felt good and light and Stella seemed to managing well. We put flea and tick spray on her before the trip, as that is a concern. After a few hours we hit a bench that was built to overlook the beginning part of the Colorado Trail, and began our journey on the Colorado Trail proper. We did not sit, as the oppressiveness of the heat blew us away. We kept moving and eventually dropped into some deeply wooded forests with nice creeks. It didn't last too long. We saw a campsite with a note from fellow thru-hikers warning of black bears raiding camps, even attacking bear hangs and shredding tents. We kept moving. We went up a ridge where we ran into a younger kid who was hefting a massive pack – big buck knife and all – who had ran out of water. A bad predicament to be in as it was hot and the next water source was some five to seven miles away at the South Platte. I gave him 1/2 liter of mine – here's hoping the kid lived. 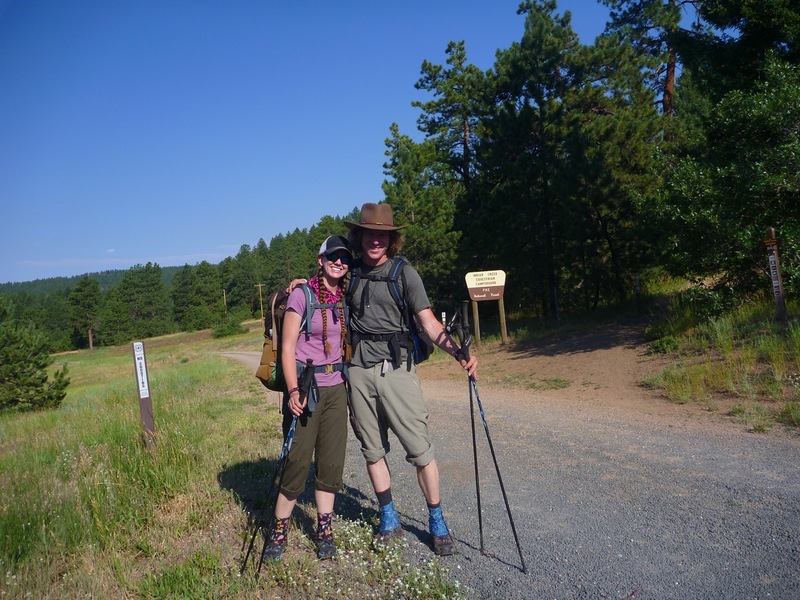 We continued onto a big ridge overlooking the South Platte and began a torturously hot downhill to the river. It was a series of endless switchbacks. Stella suffered the most. We gave her water but she was clearly overheating. This segment also wrecked havoc on Elaine's feet but we did not know it at the time. It was very, very hot. After an hour or so we made it to the river. Stella practically dove in and spent 30 minutes or so wading and drinking. Poor girl. Elaine and I also soaked in the river. It's a very wide and shallow river. 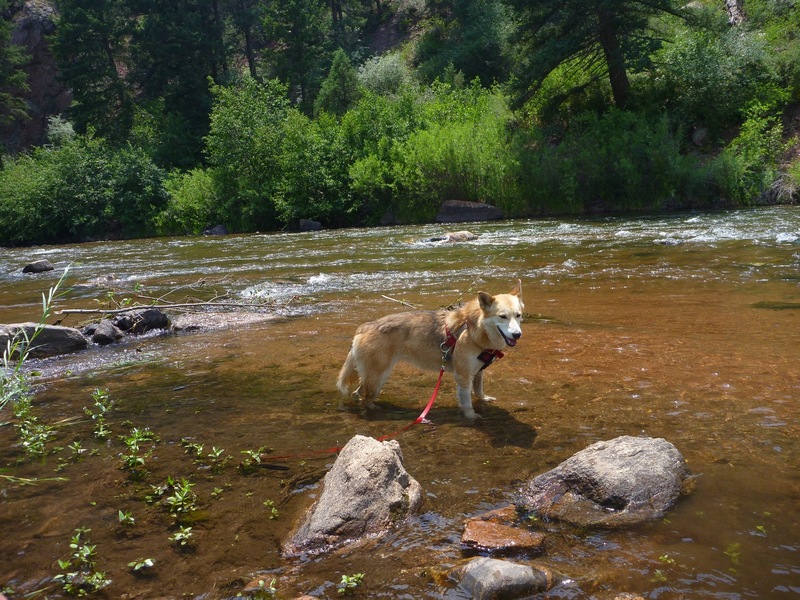 Pioneers used to refer to the Platte as a mile wide and an inch deep. It's a bit of an exaggeration but they have a point. We moved across the river to avoid some loud day trippers and decided to lounge until it got cooler. 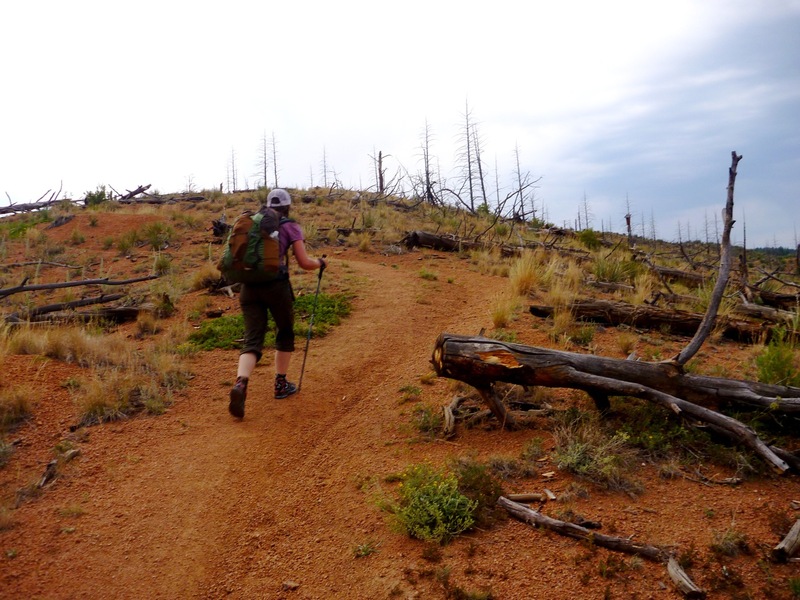 The next segment was high and dry and hot – the Buffalo Creek burn zone. There's no way in heck we would go through there in mid-day, especially with Stella. We later found out the temperature registered 106° in this segment. Honestly, Stella may well have died had we tried to tackle it. We napped by the river and tried our newly crafted food system – big titanium pot with insulation outside and food in a freezer bag. It worked like a charm! We kept drinking in an attempt to emulate camels – stock up where you can. Stella seemed to follow suit. 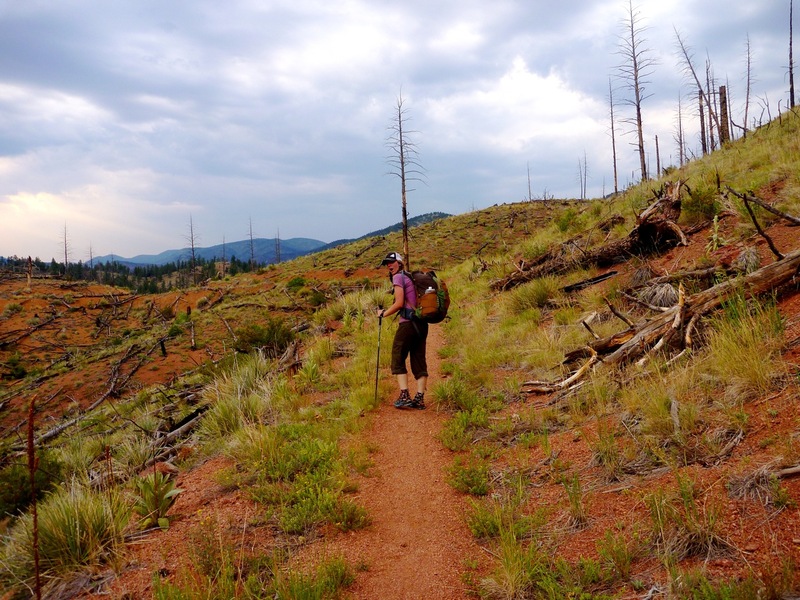 Around 6 pm – fed and hydrated – we headed into the burn. A stout climb and then into an area that looked like the tested a nuclear bomb. Super stark – we were glad we had decided to push on during the evening. We passed a few hikers who had already set-up camp. We saw few mule deer and witnessed a spectacular fire-fed sunset. We passed a junky cache – just some raman loaded into a plastic bag. Onward till deep dusk, where we set-up a horrid camp on a jeep road – hard as nails. Broke one stake, bent another (it would turn out to be more than we broke the entire rest of the trip). I noticed Elaine staring at her feet before bedtime. She did not look happy. We tried to sleep but it was too hot – maybe got in a few hours total. I so appreciate you writing everything down – fascinating read (especially for someone completely uninitiated). What does Stella eat during all of this?